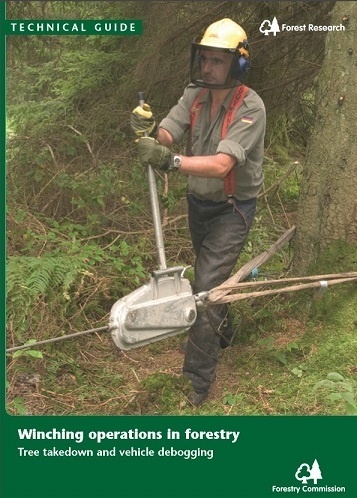 Winching operations in forestry often involve large forces due to the nature of the heavy loads involved, for example hung-up trees and bogged vehicles. There is concern that where winches are used the forces involved may not be fully understood by operators. If not carefully controlled, these large forces may threaten the safety of those carrying out the operation. This guide focuses on the principles involved in winching with the aim of improving operators' appreciation of the forces encountered and ways of implementing safe working practice. The guide also highlights safety issues for current practice when using winches, principally for tree takedown and debogging of vehicles. This guide focuses solely on the use of static hand or vehicle mounted mechanised winches and does not cover the use of vehicles used in pulling operators. The use of winches for lifting is a separate subject, especially with regard to the legislation on lifting equipment, and is not covered in this guide. The guidance contained within this publication serves as a source of information for those involved in winching operations in forestry, and is not a substitute for training. Anyone involved in winching must have first received the appropriate technical and first-aid training.